How much do we really know about the history of our school? As we get closer to the 50th Reunion of the Class of 1969 on October 18-19 of this year, we thought it might be interesting to take a look at some facts dating back to the origin of Lincoln Northeast High School, opened in the fall of 1941. The information is compliments of Betty Gage, late mother of Linda Gage Maly, who passed along to Linda her “Lincoln Northeast High School Golden Anniversary 50 Years of Excellence” book from 1991. Original plans by the Board of Education to build a new school in northeast Lincoln were announced in 1931, but it would take 10 more years before the plans would become a reality. The proposed building site was equidistant from the three existing high schools in Havelock, University Place and Bethany. Unable to get hoped for federal financing for the new school, a $190,000 bond issue was put before voters for a second time in April of 1940. Laborers were paid $.40 per hour and painters $.80 per hours as construction started in September of 1940. The project was completed in less than a year. The Board of Education requested name suggestions from students of the three combining schools, and the overwhelming favorite of students was Pershing High School. Ignoring its own mandate to let the students name the school, the Board settled on Northeast High School. Later, the Board admitted Pershing could not be used because of possible future plans to use the name for a proposed downtown auditorium. A copper 4”x4”x1” cornerstone box laid in place on Oct. 17 of 1940 included a copy of the schools’ rules and regulations, a directory of the Lincoln school system, a schedule of teachers’ salaries, a listing of members of the city council, Board of Education, architects and contractors, a map of the site, a bulletin labeled “urgent need for Northeast High School”, a system budget and superintendents report. A total of 1,037 students enrolled in the first year which included junior high and high school along with a grade school with classes from kindergarten to fourth grade. The senior class chose navy blue and gold as the school colors, but subsequently black and white (non-colors) were chosen as none of the three feeder schools had those colors. Rockets, Raiders and Pirates were nicknames suggested for the school. Students chose Rockets. The Rockettes Pep Club was initially the Sparkettes. The “N” Club was led by well-known Northeast family names. President Rex Mercer, Vice President John Knight and Secretary Cliff Squires. Faye Alice Rivett was chosen as President of the Future Grads. Lincoln High defeated Northeast, 13-6, in the first football game. Northeast also lost to Lincoln High in the finals of the 1942 state basketball tournament. “Young April” was presented as the first school play. “U.S.S. Victory” was the second semester play as focus shifted with the start of the war. Because of the war, 111 senior men joined the service upon graduation. A total of 190 students were in the first graduating class. If you are aware of any other fun facts about the origin of our school, let us know in the comment section. There might even be a test (trivia) as part of the reunion fun. Thanks for all of you who indicated your plans for the reunion last week in the comments, and for all of the new people who have registered to the website. We’re hoping many more will plan to join us in October. Hotel options for reunion stay in Lincoln are below. All but one are within walking distance from one another in downtown Haymarket area. We have two hotels with a rate guarantee time frame. Rates for other hotels can be determined by calling or through hotel website. 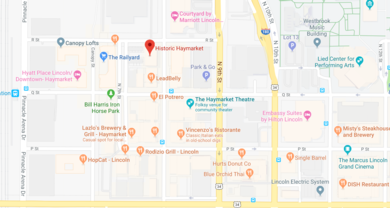 There are many more hotels available in Lincoln; these were chosen with regard to proximity to airport and downtown venues and the other hotel is between our two reunion venues. If you have questions, please let me know. Hyatt Place 600 Q Street, 888.492.8847. Ten rooms with rates available until 09.18.19 for Oct 18 and 19: king, $149 (5 rooms), double queen, $159 (5 rooms). Code G-NER9 (www.hyattplacelincoln.com). Courtyard by Marriott 808 R Street, 877.678.4105. Hilton Gardens 801 R Street, 402.475.9000. Embassy Suites 1040 P Street, 402.474.1111. Staybridge Suites 1501 N 86th Street (86th and Holdrege), 402.484.6000. Fifteen rooms in a block at these rates until 09.18.19: queen $114.99, king $129.99, double queen $149.99. Rate includes breakfast. Code NR1. Free parking.